I recently posted the garlic parmesan bread. 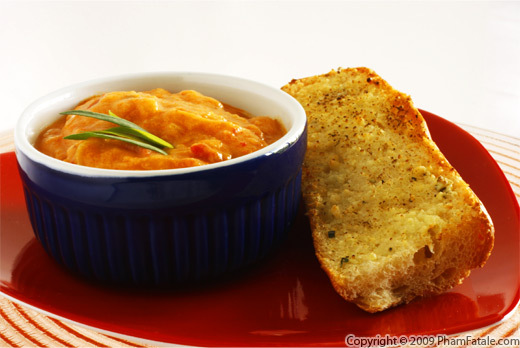 Per Anna's request, this is the recipe of the tarragon sweet potato roast bell pepper. It's a very soothing soup, especially when you are as sick as I am today. It's my version of comfort food. But don't wait until the next time you have a cold. It's super easy to make, so try it out tonight! I roasted the sweet potatoes to bring out their natural sweetness. And of course, I added some heavy cream to give it a richer mouth feel. It's always nice to infuse a strong herb into a soup, and I chose tarragon for its peppery and sweet liquorice flavor. I have a ton in my garden; it's an easy to grow perennial, and if you're looking for something to add to you herb garden, tarragon is a great choice. You won't see any potato pies on an approved list for the Atkins diet. 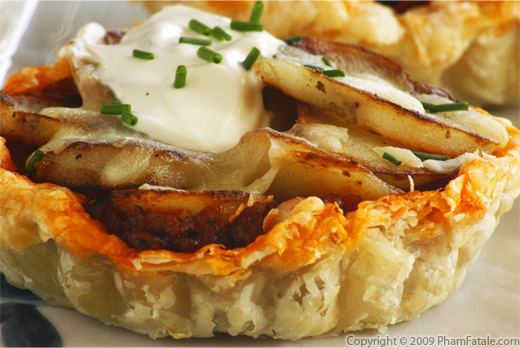 Along with a fluffy puff pastry shell, you have layers of sweet tomato sauce and fried potatoes. But that's not all! Add to that a layer of crème fraîche and some cheese. The only green is the garlic chives. It may not be healthy, but it sure is delicious! If you're feeling guilty, pair the pies with a healthy green salad. The procedure is very similar to the leek quiches I made a few months ago. Eggrolls (Chả giò in Vietnamese) are a staple in Vietnamese cuisine. 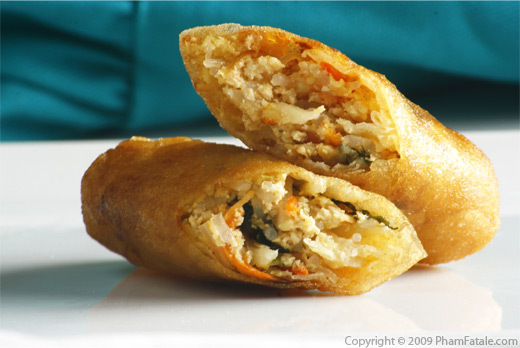 Despite its name, eggrolls contains no egg. They're filled with taro root, carrot, dried mushroom and rice vermicelli noodles. They also usually contain tofu or a meat product. This version is fried but there's also spring rolls that are not fried, I'll make those and post them some time soon. This recipe is for my version of vegetarian eggrolls. They are very convenient when you're serving a large crowd. Eggrolls are the perfect party food. You can make them large and serve them with the main course, or make them smaller and serve them as appetizers. All you need is a good fillling and a ton of little helpers to wrap the crispy delicious cigar shaped snacks. Some of my earliest culinary memories are of my mom making me wrap a bunch of eggrolls before a party. It took all of us about half an hour to wrap everything whereas if you're alone it'll take about 2 hours. It won't take that long for your guests to devour them though! 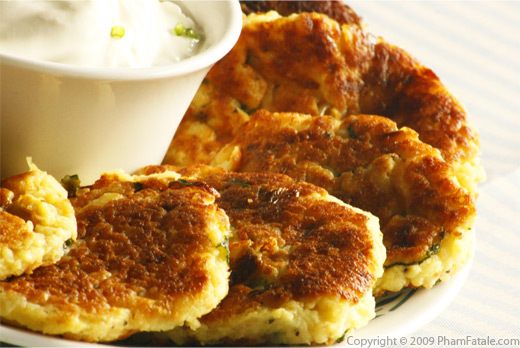 Cutlets are a slightly denser Indian version of traditional potato latkes. They are flavored with Indian seasonings like dried mint, turmeric, fried onions, and of course, spicy green peppers. We make tray-fulls of these tasty potato patties on weekends. It's a fun and easy recipe to make with kids to get them into the joy of cooking. Some of the tastiest things in life are made of few simple ingredients. 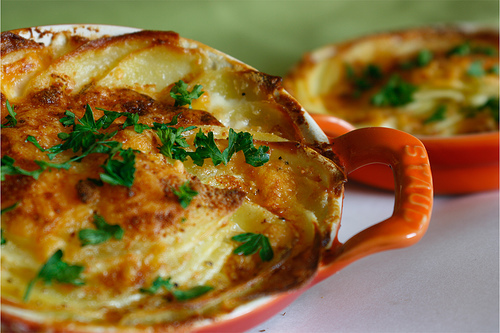 Gratin dauphinois is one of those dishes. It consists of just potatoes, cream, cheese and butter, with a little salt and fresh cut herbs as garnish. Ok, it's not the healthiest meal in the world but that's why they invented treadmills. When it comes out of the oven, hissing and bubbling, you and your guests are definitely in for a treat. Having a simple recipe like this gratin dauphinois in your culinary arsenal can help you out when you're pressed for time or when you have unexpected guests, which is often my case.